Complete Bingo Cage Unit, with balls and recess board. 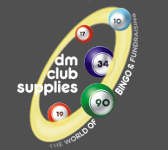 Fantastic for home use or in pubs and club..
A brightly coloured folding check board displaying 1-90 squares To be used with wooden discs (..
WINGO, The Brand New electronic BINGO machine, from the makers of the SAGA 2. This sleek and comp..
WINGO 4", The Brand New electronic BINGO machine, from the makers of the SAGA 2. This sleek and c.. Larger 2.3" audience display Raffle: Any start and finish numbers between 0 & 99999 Autom..
Selectable jackpot number Displays for next number and total calls Last number called indicat.. Displays for: next number, last number, total numbers called. Bingo: 1-75, 1-80, 1-90, or..